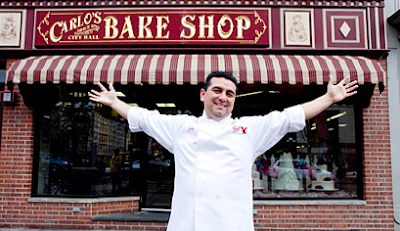 ReWind: The Cake Boss is a Great Prototyper! What could an expert cake baker teach you about prototyping your exhibit design projects? Learning to be a good exhibit prototyper is a lot like learning to be a good swimmer or a good baker. You could read about any of those skills, but to really catch the nuances and notice the little tricks, it helps to watch somebody else model the techniques a few times before you start out yourself. No, I was actually thinking of Buddy Valastro, better known as the "Cake Boss" from the cable TV show of the same name. I'm serious --- this guy is an ace prototyper! So what are some things you can learn about exhibit prototyping by watching a few episodes of Cake Boss? Before Buddy starts making a specialty cake, he sits down and has a conversation with the client to find out more about the things they like, and to bounce initial ideas around. Obviously, you won't be having a chat with everyone who comes to your museum, but how can you leverage your museum's social media sites (like Facebook or Twitter) or your newsletter to let visitors know you'll be working on new exhibits, and would like their ideas? Similarly, asking for help as you test out actual physical prototypes inside the museum is fun and exciting for visitors, and you can learn a lot from the conversations and comments around such prototyping sessions. Usually after some initial sketches and rough ideas about a cake are prepared, Buddy gathers his team to solicit input for things to try, and for which sections of the cake people would like to work on. 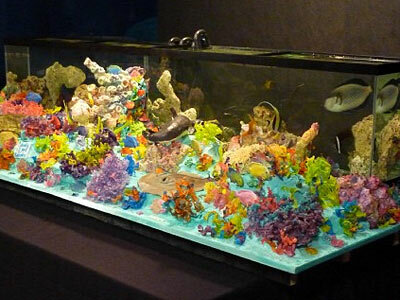 Lots of little ideas and input from the bakers and designers result in cool cakes like the "Aquarium Cake" below that includes a real fish-filled tank behind it! Similarly, when you're putting together ideas and changes for prototype exhibits, give your staff a sense of ownership and pride in the process by soliciting input and showing that even if you haven't incorporated every single idea into the final product, you were willing to sincerely try things out. To be able to realize the exhibit equivalent of a "Fire Engine Cake" be willing to throw some crazy ideas against the wall to see what sticks. But to prototype those wacky ideas it helps to have some simple building stuff (masking tape, paper, cardboard, markers, etc.) handy so you don't lose the enthusiasm and momentum of the moment. Occasionally, something catastrophic (cakeastrophic?) happens on the Cake Boss show. Somebody drops a finished cake down a flight of stairs. Someone else delivers the wrong wedding cake. Yes, there may be some yelling, but after everyone calms down they take a deep breath and figure out how to solve the problem. Now I hope I've inspired you to watch a little Cake Boss and to do a little more prototyping in your museum. Hey! Maybe TLC should start a new show --- Exhibit Boss!